the photo i chose is by a Japanese photographer by he name of T. Enami (1859-1929). Enami was a prolific photographer who opened his studio in Yokohama in 1892. Enami was distinguished by his stereoviews of Japan and Japanese culture. those stereoviews were later taken and skillfully hand-tinted into glass lantern slides. above is the raw, undisturbed stereo proof and on the bottom left is the tinted version. i chose this photo mainly because of the subject. Enami seemed to have a fascination with geishas, but most often than not, he captured them in a more serious state. i loved how even though she really is a geisha, she is dressed as more of a common woman at the time, and the expression on her face is one of pure happiness and amusement. the way she has her arms up helps frame her face, which to me is the focal point of the photo. the tinted version of "geisha and lilies" is simply beautiful. the contrast of the soft pastels and whites against the rich blacks of the background is very striking. 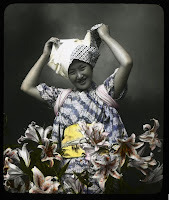 even in the raw proof of the photo the contrast between the dark brown and white of her clothing and lilies is prominent. This picture is really interesting. Before reading your statement you only see whats on the top layer of this picture, but after reading your statement I was able to dissect this picture and understand everything you see. This picture is cute and interesting. I thought the photographer took an ordinarily Japanese female. I agreed with your idea that she looks fun and enjoyed photo shooting. I am Japanese but I do not know about him at all. Even thought I took Japanese photo history class in Japan. I found his web references in English rather than in Japanese. The portrait of this girl is very beautiful. I like the way the soft colors mix with the black and white background. This picture really discribes to me how this girl is, very young of heart. I can understand why you have responded to these images. They are much more playful than typical early photographs. You have used the terms from The Photographer's Eye effectively.